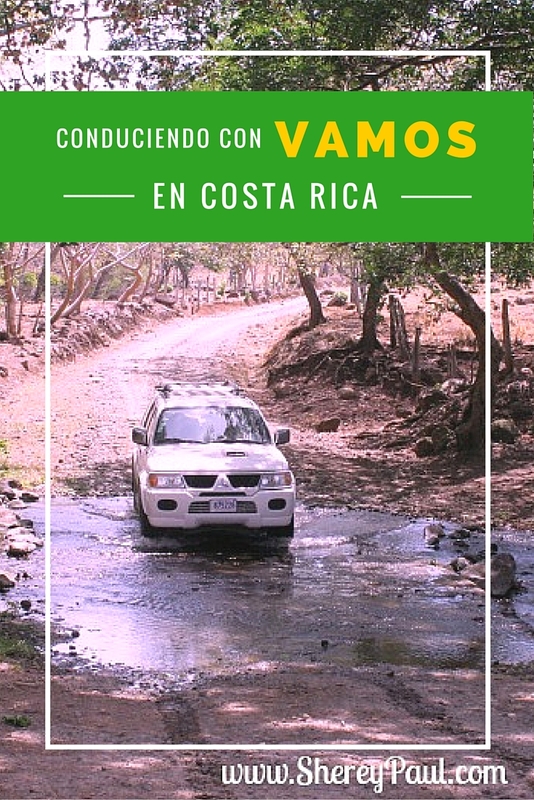 We want to share our experience driving in Costa Rica with Vamos rent-a-car. Before we went to Costa Rica we had a lot of questions about how people drive in Costa Rica, which kind of car to rent and which rental company to choose. 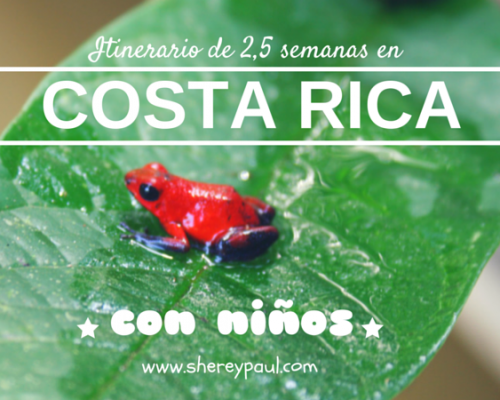 We’ll answer all the questions we had in this post, so you’re planing a trip to Costa Rica you can already have some answers. 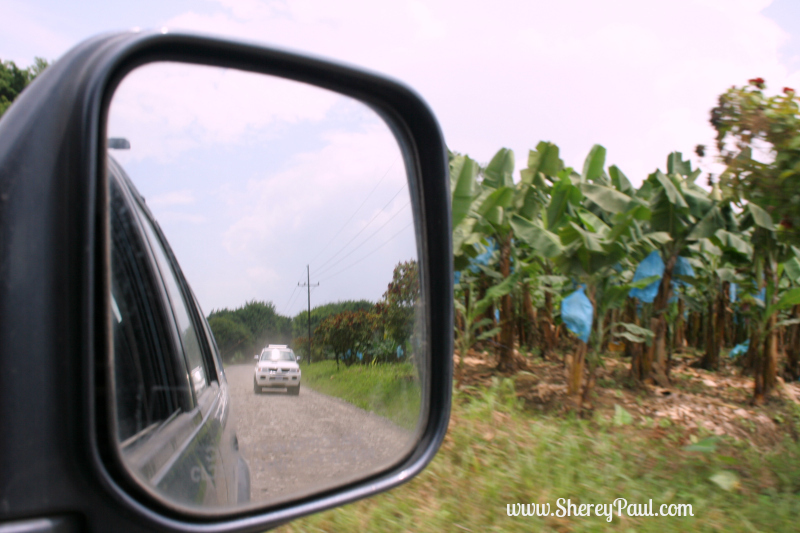 In general the driving conditions in Costa Rica are not so good, there’re many non-asphalted roads. Probably the one road you’ve already heard of is the road to Montenegro. I you read the road to Montenegro is terrible, I can also say so. Even though they are working on the road, it won’t be asphalted. The idea behind is that people drives slow in a non-asphalted road and can avoid killing animals crossing the road easier than on an asphalted road. Even though you drive on an asphalted roads don’t expect to drive very fast. In our post itinerary and costs for 2,5 weeks in Costa Rica, we mentioned that the 80km drive to the Volcán Poás took us almost 3 hours. Around San José the traffic is pretty slow and unless you are driving the highway 1 don’t expect to drive 100km/h. We have prepared a short video showing some parts of our driving in Costa Rica with Vamos rent-a-car. The first seconds you can see the road to Monteverde. When we were thinking which kind of car we wanted to rent (a regular car or 4WD), we took into consideration our route. 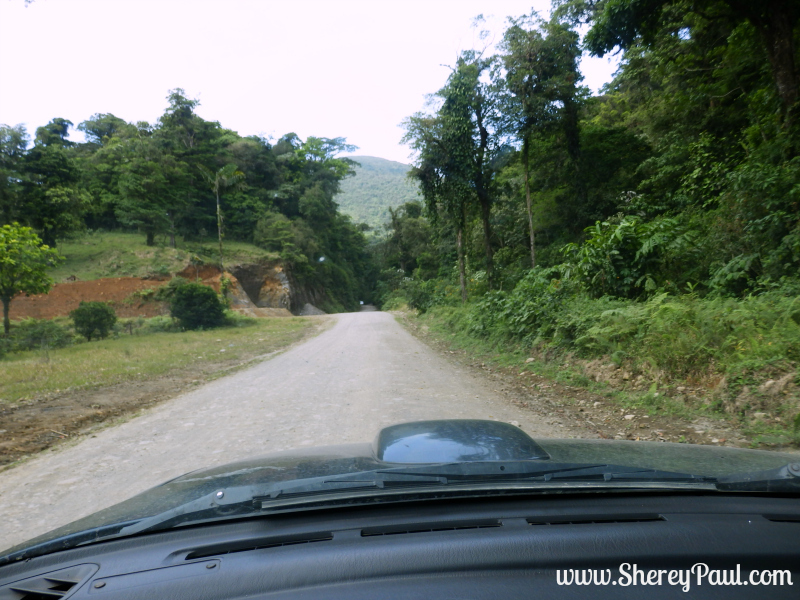 As you just saw the road to Monteverde was very bumpy and dusty. Imagine the same road after some heavy rain!! 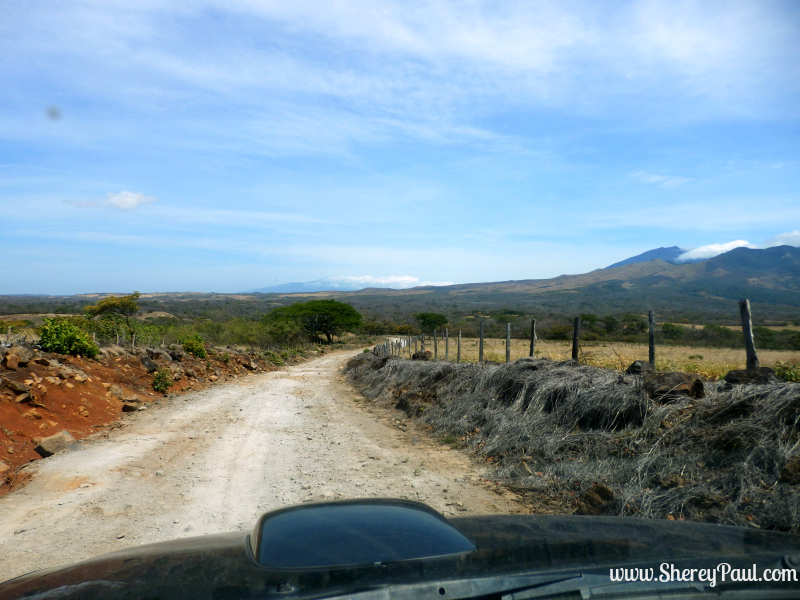 This was one of the reasons to choose a 4WD: you can drive anywhere in Costa Rica with a 4WD. As we were at the end of the high season we were expecting some heavy rain, luckily for us the rain came this year much later and we only have some rain two days. The first time on the road from Monteverde to Arenal (even tough it wasn’t heavy rain, driving with the 4WD was much comfortable). Also a 4WD is a lot of fun for the big boys when you take a shortcut, like the one we took from Rio Celeste to Volcán Miravalles. 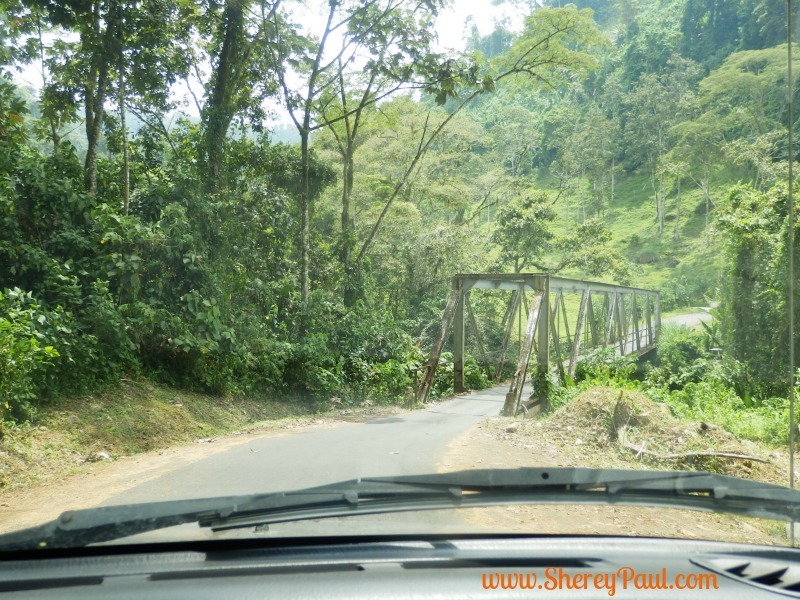 There were some narrow bridges, a very uneven non-asphalted road and even a river to cross. Therefore, if you ask me, I would rent a 4WD in Costa Rica, you won’t have anything to worry about and it will be a lot of fun. 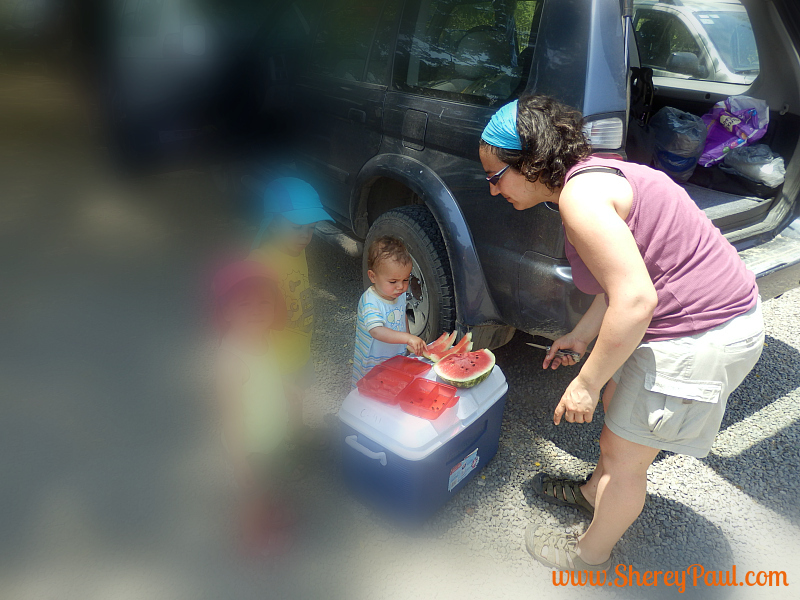 We rented two 4WD’s from Vamos rent-a-car and we were very happy about our choice. They have very affordable rates for 4WD. If you compare them with other companies, Vamos rent-a-car has much lower rates and offers more services for free. For example, you can let them bring or pick your car in your hotel. This option is perfect when you travel with children. After a long flight the little ones are tired or hungry or maybe they just want to run outside. So if you can, arrange a pick up with your hotel and let Vamos bring the car to the hotel. The little ones can enjoy the swimming pool while you’re doing the papers for the car. 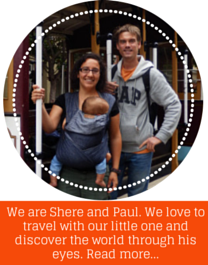 Vamos rent-a-car is very family oriented as they also offer one baby seat for free. If you need a second one, as it was the case of our friends, the second seat costs 1,95$/day, which is cheap if you compare with other companies. For that price, I won’t take my own chair in the airplane. 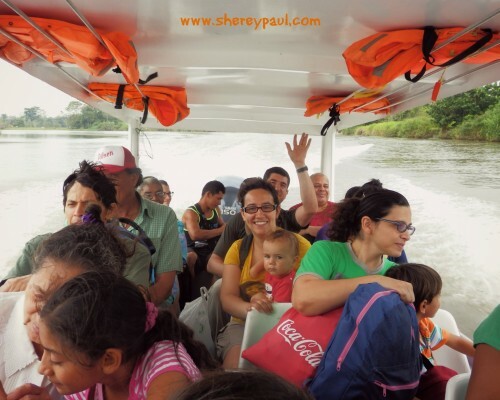 Please mind that in Costa Rica the baby seats can only be used in the middle row, no seats are allowed in the co-driver seat or in the extra row of the 4WD with 7 seats. Last but not least, Vamos rent-a-car offers one additional driver for free and you even get a cell phone with a local sim card. If you have any problem, you can make use of the phone. In all the countries we have been, we haven’t had this service and it’s quite handy. 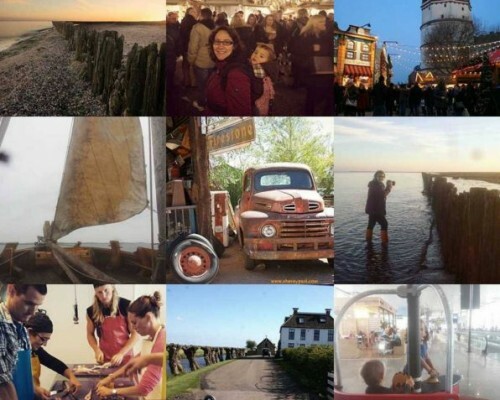 Our experience with Vamos rent-a-car was very positive, we loved our cars (they were delivered clean, while at the end of the rent they were really dirty), the stuff was helpful and we got everything we needed for our holidays. 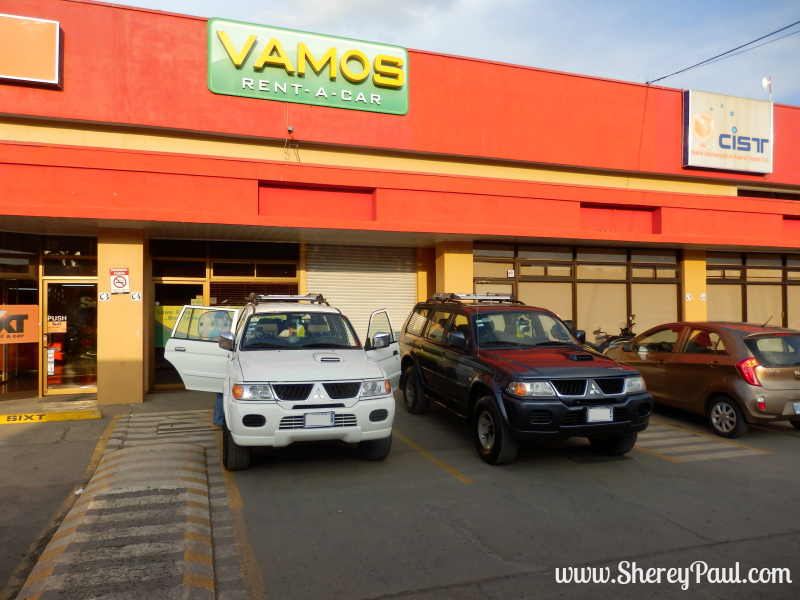 If we come back to Costa Rica, we’ll rent a car from Vamos. I do believe renting a car and seeing the outside of the major cities really helps you to understand a country better. 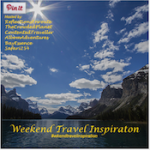 Thanks for sharing and linking up with Weekend Travel Inspiration! In Costa Rica the public transport also takes decades to reach their destination, so a car it’s the best option to save some time and visit places the public transport won’t reach. You guys are brave with renting a car and driving around Costa Rica yourselves. It’s great that the company provides you with a phone in case you run into any problems. When we went to Costa Rica we hired a driver and he drove you all over. The roads are horrible and the kids got car sick. Sweet memories of Costa Rica :). To say that roads there are not so good is an understatement. Outside of sizable cities depending on parts of the country, they range from pretty bad to awful, especially during wet season. Said that, the only way to see an unspoiled, authentic Costa Rica outside of tourist areas is to rent a 4WD and get on the road. Public transportation is so… unhurried and unreliable that it’s too much pain to depend on it. Good to hear that Vamos worked well for you. The main thing that we found when we drove around Hawaii was how slow it was driving around an island, but I can’t even imagine driving on dirt roads! It sounds like Vamos was a great rental car agency, especially since they let you borrow a cooler! we were happy they provided us with everything we needed. You’re right! The roads in Costa Rica are not that great at all. Like you, we rented an SUV type vehicle when we were there a few years ago. 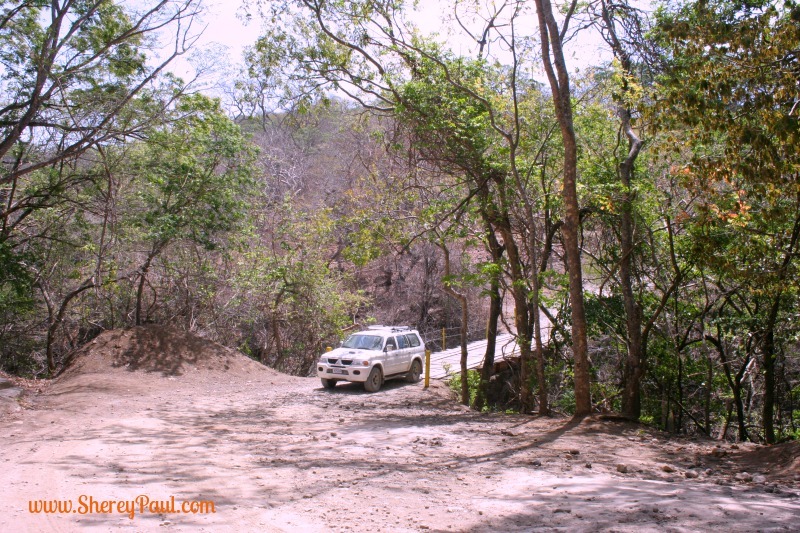 The road down to the tip of Guanacaste to Montezuma was horrible. 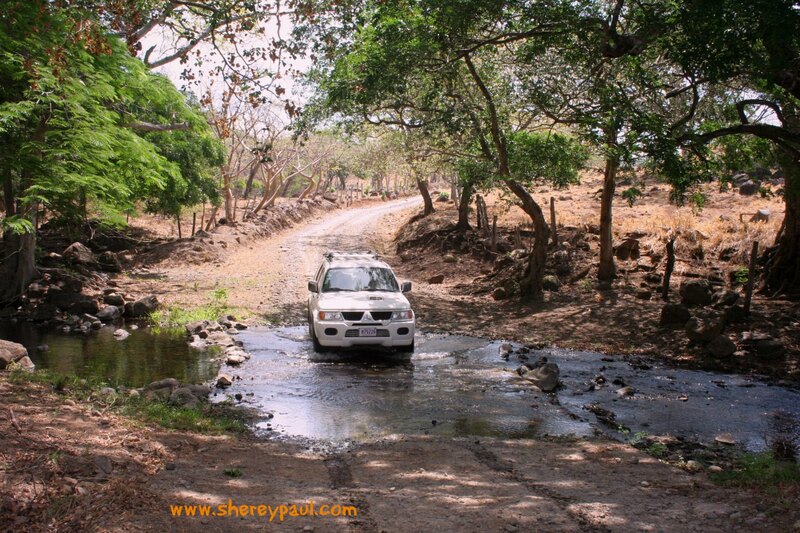 We didn’t drive that road, but I have heard Guanacaste has beautiful places to visit. Thanks for sharing these tips. I have friends who go down regularly and hire a driver, but I like to think I’d rent a 4WD and attempt the roads myself! It’s a pain to drive in places that have poorly maintained roads or no roads at all. 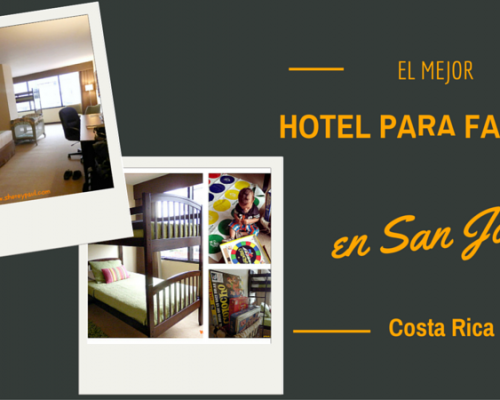 However, it’s great that you could rent a car and drive around Costa Rica. At least you could see a lot. You must be very brave though to drive outside the tourist area with a small baby. A million thanks for posting this inorimatofn. Unfortunately, Costa Rica is one of the countries with the poorest road infrastructure in all Central America. You want to get a 4WD for real. Sounds like a worthwhile service. There’s a possibility we will be traveling South America next year, so this will be a useful tidbit of information to know if we decide to do so. They offer a cooler with a car rental? Nice! I also like that they give you a phone with a sim card. Sounds like a great company to rent a car from! Great suggestion for when we return to Costa Rica. Would absolutely want to travel around. We were there as a taste test on a Cental America cruise. Our mini bus travelling in country barely made some spots so I would certainly want a 4WD.